Artemis (Advanced Relay And Technology Mission) is a telecommunications satellite using advanced technological standards built by Alenia Spazio, a Finmeccanica company, as prime contractor to the European Space Agency [ESA]. It was launched in July 2001 by an Ariane-5G rocket from the Kourou launch base, but due to a launch vehicle failure, it was left in a much lower than desired orbit. Due to the on board ion engines, it was later able to reach the geostationary orbit. SILEX (Semi-conductor Inter-satellite Link Experiment) uses optical frequencies; it will work with SPOT 4 and OICETS. It was successfully tested in Nov 2001 at 50 Mbps from a subsynchronous orbit. Artemis will carry a payload known as LLM (L-band Land Mobile) which will provide mobile communications services throughout western Europe and neighboring regions, including the Mediterranean, the Middle East and parts of Russia. The LLM payload has four coverage beams, one that will extend over the entire area and three (known as spot beams) that focus on specific parts. The versatility offered by the three spot beams will be further enhanced by the LLM's capability to allocate bandwidth, power and frequencies across the four beams in response to changing communications demands. 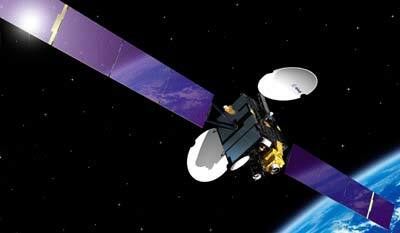 LLM will be leased to Eutelsat. A navigation payload (25 kg) was also added. It is part of the EGNOS program (European Geostationary Navigation Overlay Service). Two Inmarsat-3 satellites are also part of this program. The Artemis satellite was to be retired in 2014, but in October 2013 ESA has agreed to sell the aging Artemis satellite and all future rights to the satellite’s 21.5° east orbital slot to Avanti Communications of Britain. It was moved to 123° east in 2015 to preserve the L-band rights for Indonesia as a replacement for Garuda 1 at this location. After Indonesia failed to pay for these services, it was retired and deorbited to a graveyard orbit in November 2017.